Ecwid made a huge announcement yesterday and if you missed it here is the big news: Ecwid is the first eCommerce platform to collaborate with Gmail to launch dynamic eCommerce emails for online merchants. Built on AMP (Accelerated Mobile Pages) technology, Ecwid store emails now display accurate and up-to-date information at every open providing an up to date status at all times. If you are not using Ecwid yet, you need to sign up below. 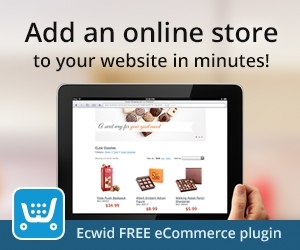 This revolutionary feature will be available in every Ecwid eCommerce plan, including the forever free plan. If you still have doubts, learn more in my in-depth Ecwid eCommerce Webinar. Ecwid announced on PRNewswire that dynamic email will allow real-time inventory updates, shipping status updates, and more. A single email can contain dynamic content like up to date order information, order status and shipping confirmations. Everything is automatically updated. This reduces inbox clutter and makes the email eCommerce process much more efficient for both the merchant and the consumer. “Email has always been the revenue-generation workhorse for e-commerce operations, but its static nature has limited the medium’s ability to change with the pace of business,” said David Novick, Vice President, Marketing, Ecwid. Ecwid offers a very conversion-focused buyer journey when navigating their online stores. Ecwid’s dynamic eCommerce emails are very conversion focused. They will help guide buyers to complete sales allowing you to capture to your audience and gain more clicks. Dynamic emails will also help Ecwid sellers reduce store management time. Let’s have a look at how this will apply to your Ecwid store. Ecwid rolled out an amazing automatic abandoned cart recovery email feature in 2017 Their new dynamic ecommerce emails are going to take this already incredible feature one step further. Abandoned cart emails are automatically sent to store visitors who do not complete their purchases two hours after they abandon their cart. This email is personalized and currently contains a link back to their cart. Ecwid states that merchants who use this feature recover an average of 15% of abandoned carts. My clients and myself have actually experienced just that, between 12 and 15% conversion rates thanks to the automatic abandoned cart email. According to Ecwid’s support site you can easily add coupons to the new abandoned cart emails. This is a very powerful feature that will also improve customer experience and eCommerce conversion rates. Tracking order status has always been a tedious process for online shoppers. I know I love to know where my orders are, and that usually means I have to go back to the website I purchased from, sign in to my account, search through a couple pages, click on “track my order”, and then finally see my order status. With Ecwid dynamic emails, you can offer customers accurate and always up-to-date order status information from one single email. Each time your customer opens their confirmation email, they’ll see the latest updates and information about their order. If you change the status from “Paid” to “Shipped” in the Ecwid Control panel, your customer will see it in their dynamic email. At the moment, if an order is placed through your Ecwid store, the Ecwid merchant gets notified via email. As a seller, you have to go back to your Ecwid seller control panel, and make a couple clicks before being able to update the order status. With Ecwid’s new dynamic emails, merchants will soon be able to manage orders right in their order notification emails. You’ll have the power to quickly and efficiently manage orders from any device without clicking through to a website or mobile app, creating a seamless — and effortless — store management experience. 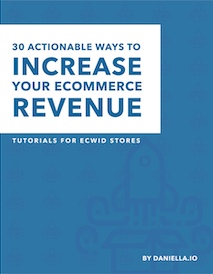 Learn how to build a powerful Ecwid eCommerce store, drive targeted traffic and get sustainable sales! 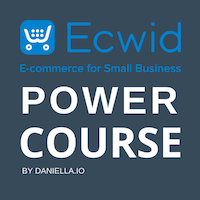 Click on the Ecwid eCommerce Power Course below to learn more. Ecwid already offers incredible user experience. I honestly didn’t think it was possible for them to further improve their already stellar customer experience until I activated their new streamlined checkout process. Then I realised UX seriously is one of Ecwid’s core business value propositions. Ecwid truly is very focused on offering the best possible user experience for their customers, and their customer’s customers (so your eCommerce clients). The seller control panel back end is extremely easy to understand and use. And their online storefronts are very easy to navigate. I have a full guide on how to embed Ecwid stores on multiple websites This is one of Ecwid’s unique features. They also got you sell on Instagram Facebook Amazon and eBay. And now you can sell to email! This new feature is visionary. I’m proud to be using Ecwid to run my online businesses and to have the opportunity to benefit from dynamic emails. And the best part is there is no actual development, fees, or activation required! Dynamic emails will automatically be enabled on all Ecwid stores with no additional action required. The feature will be rolled out soon to all US-Based stores For now, dynamic content is only available within Gmail inboxes, but Ecwid will be making these emails available on more platforms soon.